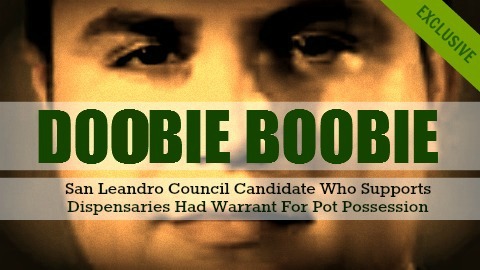 ELECTION ’12//SAN LEANDRO CITY COUNCIL DIST 4 | A San Leandro city council candidate who has previously stated support for bringing medical marijuana dispensaries within the city limits was recently notified of a police warrant for marijuana possession, according to sources familiar with the disclosure. Chris Crow, a candidate for the District 4 council seat in San Leandro’s somewhat conservative bedroom neighborhood of Washington Manor, according to sources, was cited sometime in the last two years for possession of under an ounce of marijuana. He was issued a ticket, but failed to pay the fine, in most cases, treated the same as a simple moving violation. Although the exact date of the citation is not known, the process of ticketing violators followed the decriminalization of possessing small amounts of marijuana began in 2010 under Gov. Arnold Schwarzenegger. In such cases, nowadays, a citation is given and once paid; the ticket is expunged from the person’s record. In the recent past, Crow has been a strong public supporter for allowing medical marijuana dispensaries to open shop in San Leandro. Over the past two years, the City Council has wavered from prohibition to a willingness to discuss the hot-button issue unpopular with older San Leandro voters. Crow’s brief foray into city politics has been muddled in controversy for nearly a year. His campaign, based upon opening up San Leandro’s lackluster business climate with more lenient zoning and policies for entertainment options in the city and new streams of tax revenue, faced controversy earlier this year when he began an early challenge for Councilwoman Ursula Reed’s seat in his native District 2. As Reed’s appointee to the city’s planning commission, she was angered by Crow’s designs for her seat and moved to have him replaced. Some in the city were also unsettled by Crow’s strong connection and advocacy for the owner of the Bal Theatre, Dan Dillman, who is also running for council in District 2 amid a zoning battle with City Hall. However, instead of running against the incumbent, Crow moved his address to the open seat in former Councilwoman Joyce Starosciak’s District 4. Starosciak was termed out this fall and resigned in August to relocate outside of the county. Known to some as a potential up-and-comer in San Leandro, Crow’s strong opinions and penchant for speaking before thinking has gotten him in trouble in the final few months of the race for council. Last month, his comments on Facebook calling Chinese Olympians, “cheaters” and “the sorest people in the world,” angered a large part of the city’s large Asian American population. The demographic makes up San Leandro’s largest racial group with nearly 30 percent of the population. Crow has also upset residents in the Heron Bay community for the perception he accepted campaign donations from a wind turbine company in the area who plans to controversially erect a wind turbine in their backyards, on the San Leandro Shoreline. And, his recent alliance with noted anti-worker Mayor Stephen Cassidy has also soured progressives in the city. Posted in Arnold Schwarzenegger, chinese, Chris Crow, dispensaries, District 4, medical marijuana, S.L. City Council, San Leandro Police, Stephen Cassidy, Washington Manor, wind turbines. Bookmark the permalink. learn how to write 10:21 you make zero sense. 10:32pm Marga and Crow: I write anyway I want to like Crazy Marga and Liar, loser, crook Crow! Freedom of speech, you hear! Yeah, Marga, spell check me – flunk your bar exam! MARGA AND CROW BOTH ARE LOSER! 10:21 by Crow, smoking pot with his supports. 10:32 you're right, Crow make zero sense. Marga is a CYBER STALKING FREAK! She looks up voters database on people. No pot heads in city council. Attacks and belittles writing skills of SL citizens not helping Chris Crow's campaign. Both Crow and his campaign advisor are jobless. Both should be in 24 hours fitness 24/7 vs. 24 hours behind computers. I don't care what you bunch of looser think the man gets our vote and will win this election. We will not vote for Loser Crow and he will not win this election. This loser has no job, lies, made offensive odor comment, took bribe, made deals with every of his endorsors. Most of all, Crow totally disconcern his pot possession warrant, even K-9 discharge urine at this loser.